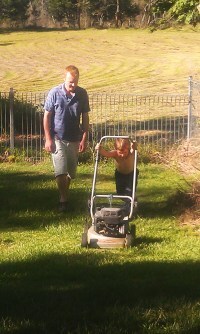 Today Bright Eyes decided that he wanted to earn some real money so he asked if he could mow the lawn. He lasted over 10 minutes and did about half. Here you see some wonderful scaffolding and framing (good ol' RDI terms), walking beside and then helping push up the hill when it was needed.